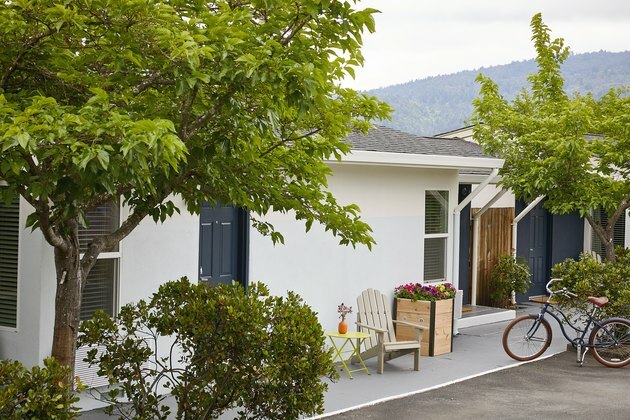 A newcomer to the Napa Valley, Calistoga Motor Lodge & Spa aims to offer weekenders something a bit different from the standard upscale accommodations you'll typically find in the area. 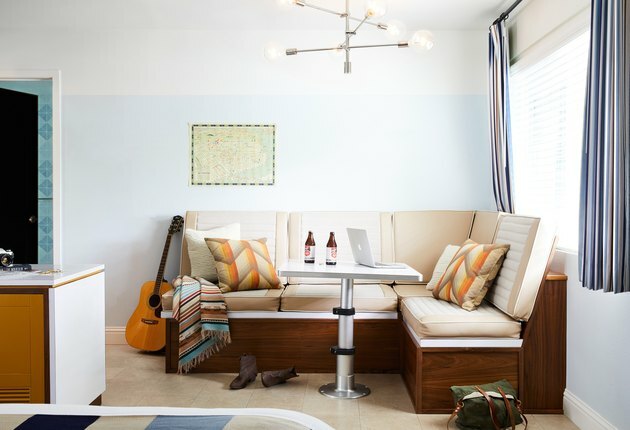 The 50-room property, once a dated and worn roadside motel, was revamped by AvroKo with an aim to evoke "the great American road trip that was in its heyday during the '60s and '70s," explains Kristina O'Neal, a designer on the team. 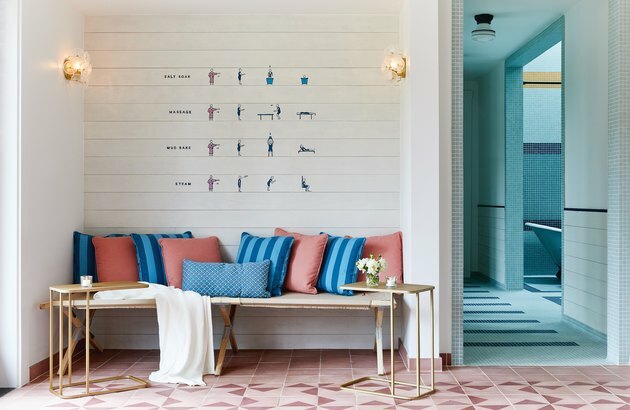 Another source of inspiration was set designs that appeared in films by Wes Anderson (think vintage hues and washed-out vistas), particularly to inspire the pool area. "The spa was a mash-up between Wes Anderson films and the quack apothecaries of yore," says Adam Farmerie, also of AvroKo. Coats of white and dusty-blue paint applied to each of the buildings are a calming welcome upon arrival and matched with vintage bicycles, Adirondack chairs, and furnishings in citrus hues (like the yellow metal café table and orange vase). A custom banquette sofa (from GoodShop Manufacturies, owned by AvroKo) covered in velvet blue-green fabric next to a crackling fireplace in the lobby lounge is glammed up further with Moroccan poufs from John Derian Company and CB2 decorative pillows. 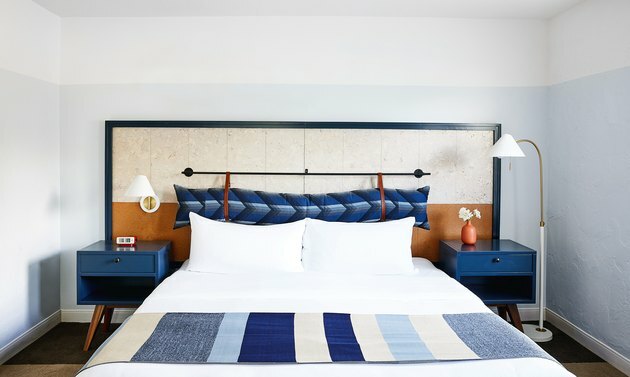 Sticking to a cobalt and white decor theme, the designers decked out each room with a Studio Twist bed throw, West Elm nightstand sconce, and a custom nightstand and custom cork headboard (covered in DesignTex headboard-pillow fabric) from GoodShop Manufacturies. 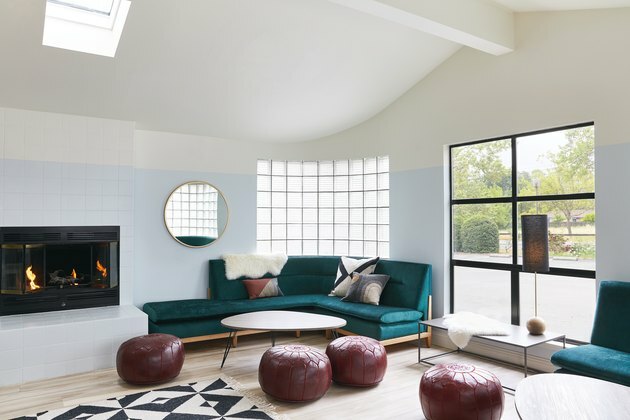 The seating area in some of the rooms includes custom dining banquettes and table-tops from GoodShop Manufacturies and Eiffel dining chairs from France and Son. The timelessness of stripes is seen in umbrellas and throw pillows in the pool area, with the continued blue-and-white decor that mirrors the pool and the blue sky. 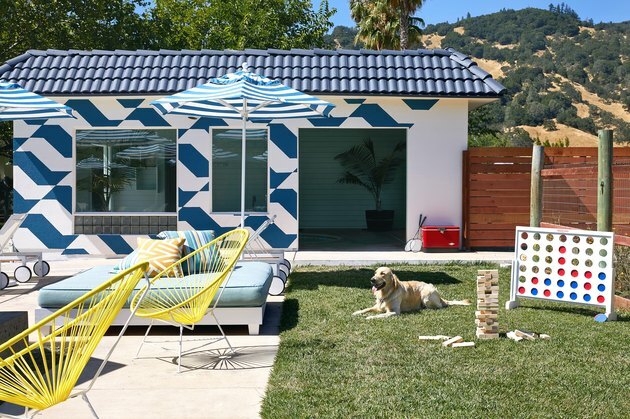 Yellow Acapulco chairs and life-sized games of Connect Four and Jenga are fun accents in the garden area, which also features a wall of geometrics in the property's trademark blue-and-white scheme. Borrowing from midcentury-modern design, the spa's heather-grey Mylo chairs (from West Elm) and accent colors of salmon and aqua are depicted in a YLiving coffee table, Pelle chandelier (from West Elm) and AllModern's hexagon side tables, perfect for resting a cup of tea. Based in Wisconsin, Kristine Hansen covers art, architecture, travel and food/drink, and lives in a 1920s bungalow.